The worst accident in Boston public transportation history occurred on the night of November 7, 1916. A streetcar loaded with passengers smashed through the gate at the Summer Street drawbridge, and plunged off the open span into the Fort Point Channel. 47 people were tragically killed. The pubic service commission did not have rules about streetcars stopping at drawbridges. 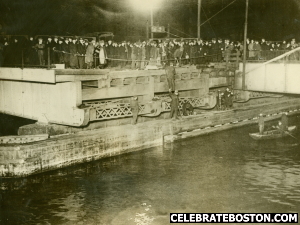 In downtown Boston, drawbridge gates had ranged from 23 to 48 feet away from the draw on various bridges, with no standards for size, color, distance, or illumination of stop or warning signs. "In his report of the accident Chief Inspector Bishop states the motorman Gerald Walsh declared that he had stopped several times just prior to the accident and nothing seemed amiss, until he suddenly discovered that the warning gates were across the street and the draw was open. The motorman claims to have immediately applied the brakes and reversed the current, but the car was only 25 feet from the opening, and it crashed through the gates and into the water. Motorman Walsh estimated the speed at 8 miles an hour, but a passenger on the front right-hand step at the time estimated the speed at 15 miles. The report of the inspector's department furthermore adds that the condition of the track approaching the draw opening was, soon after the accident, found to be favorable for the safe operation of cars. A "stop" sign, about 17 inches long and 4-1/2 inches wide with letters 2 by 3 inches, suspended to a span wire 30 feet above the rail, is located 175 feet east of the gates and 200 feet from the draw opening, and according to the rules of the company the motorman must bring his car to a full stop before passing such a sign. The motorman states that he did not make the stop on the fatal run, but slowed down sufficiently for a man to board the car, and then proceeded without receiving two bells from the conductor. This action was declared to have been a violation of the rules of the company." It appears the cause of the accident was due to an error by the operator, as he did not come to a full halt at the designated stop signs. The operator was not charged with manslaughter, which was often the case in the early 20th century after transit accidents, so mitigating circumstances must have contributed to the accident; the stop sign was not illuminated, and the gates were only 25 feet from the draw. "That every street railway company in the Commonwealth operating cars or trains over drawbridges on surface lines, shall at once establish positive stops at a reasonable braking distance from each drawbridge, subject to the approval of the Commission, to protect traffic going in either direction and shall erect at each stopping place a stop sign, visible both by day and night, the type of sign and rules governing its use to be approved by the commission. That every such company make seasonable application to the proper municipal authorities for the location or relocation by such authorities, at a reasonable braking distance from each end of each drawbridge, of suitable gates, painted with alternate white and black diagonal stripes and provided at night with red lights located at reasonable intervals on the upper portion, such gates to be properly illuminated and interlocked with the bridge machinery so that the same cannot be operated unless all the gates are closed. That wherever it is for any reason found impracticable to secure such location or relocation of the drawbridge gates, every such company, provided the necessary consent is secured from the proper municipal authorities shall install and maintain, at a reasonable braking distance from each end of each drawbridge, a smashboard signal or similar device so interlocked with the operating mechanism of the draw span as to make it impossible for the draw tender to open the draw before the smashboard is in proper position."